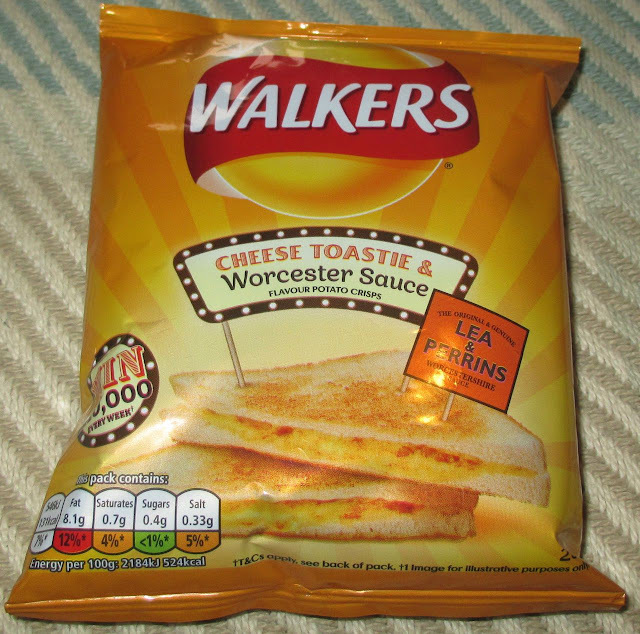 We are still working our way through the new Walkers crisps flavours, all inspired by a branded sauce. Today we are testing out the Walkers Cheese and Lea and Perrins Worcestershire Sauce variety of crisps. I have to put in a disclaimer here that in my opinion cheese on toast with Worcestershire sauce is one of the greatest snacks of all times. I had high expectations for these crisps. I opened up the bag and the cheese aroma seemed rather pleasant. I tucked in and found the crisps to be nice, but not the wow flavour I’d been hoping for. The Lea and Perrins Worcestershire Sauce part of the flavour was the star, it had its spicy but slightly sour edge and it left a warm spice in the back of the mouth. I liked this tangy taste, and felt it was a good representation of the sauce flavour in crisp form. The cheese was where it let me down, I found the taste of the cheese to be too musty, it didn’t quite represent that creamy flavour you get from melting cheese. I’d happily have these crisps again, but I felt they could have been the best out of the bunch if the cheese flavour had been a bit softer. I guess they are nearly a winner, and the Worcestershire keeps them in the game.